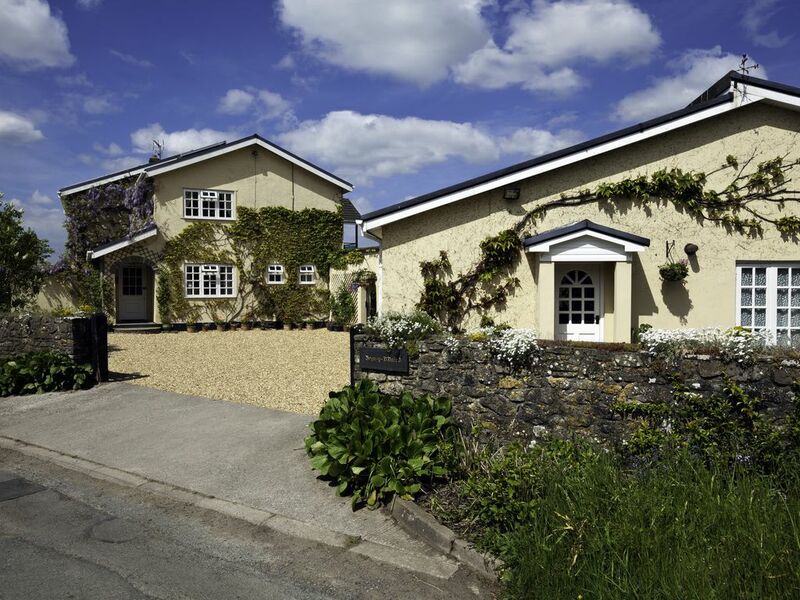 Graded 4 Stars by Visit Wales Y Bwthyn Bach is surrounded by the beautiful countryside of the Vale of Glamorgan and lies just three miles from the historic town of Cowbridge with many fine restaurants and shops. The property benefits from new PVC external doors and windows fitted in 2017. The owners house is immediately next to Y Bwthyn Bach and they are normally on-site should any unforeseen problems arise. Off road parking is available in the forecourt between the bungalow and the house. The ground floor accommodation consists of an open plan lounge / kitchen area. The front door opens into the lounge area with large settee, easy chair, 32" freeview television and DVD player. A unit displays a wealth of tourist information and maps etc. Within the kitchen area are a dining table and four chairs. There is an electric oven and hob, a small microwave, a fridge and a small washing machine, ironing board and iron. Ample cooking utensils, crockery and cutlery etc are provided. The back door leads from the kitchen area to an enclosed patio with table and four chairs for those 'al fresco' meals. Access to the large rear garden (National Garden Scheme approved) with various options of sitting is via the patio area. The bedroom can be twin or king bedded with ample storage space availability in the large wardrobe, chest and bedside cupboards. There is a second smaller television in the bedroom. All bedding is supplied and in the case of lets longer than one week, changed weekly. The bathroom has a wash-hand basin, w.c. and bath with fixed overhead shower. Towels are supplied and also changed weekly. Alongside the bungalow is a lockable storage area for those wishing to leave bicycles, golf clubs etc. Clothes drying facilities are also available for walkers, golfers and cyclists. The property is surrounded by a network of public footpaths and in addition over 300 acres of forestry are approximately 1 mile away. There are numerous golf courses nearby. The Vale Resort boasts two eighteen hole courses as does Cottrell Park. The Celtic Manor (a past venue of the Ryder Cup) and The Royal Porthcawl are also within easy reach. Cardiff is the vibrant Capital City of Wales. The City Centre and Cardiff Bay are both approximately 10 miles away. A weekday Park and Ride service runs from the car park of Cardiff City Football Stadium (approximately 6 miles away) to the City Centre. There are numerous tourist attractions in both the City Centre and the Bay and include Cardiff Castle, The National Museum and Gallery of Wales, The Principality Stadium, The Senydd (seat of the Welsh Government), The Millennium Centre and The Doctor Who Exhibition. Other notable visitor attractions nearby are The Grade 11 listed Dyffryn House with its Grade 1 Listed Gardens, St. Fagans National History Museum, Castle Coch and Caerphilly Castle. 14 Miles of protected stunning coastline known as the Glamorgan Heritage Coast lie waiting to be explored. The historic towns and villages en route have a wealth of myths and legends. With the South Wales Valleys, the Brecon Beacons and the Gower Coast all easily visited in a day make Y Bwthyn Bach an ideal touring base for South East Wales. The property was purchased by the present owners Glyn & June Jenkins in 1974. It was then a small stone built cottage in very poor condition with no electricity, mains water or sanitation and the garden was very overgrown. The cottage was demolished and the main house Bryn-y-Ddafad was built and completed in 1977. It was then occupied as a family home until 1998. At this time as our children had left home we decided to offer bed & breakfast which we still do today. In 2006 we decided to convert what was a large garage and stable into further accommodation , this is now the bungalow currently advertised as Y Bwthyn Bach which has been let as self catering accommodation since that time. We love living in this location, guests remark how peaceful it is. Our address is the village of Welsh St. Donats but we are about one mile from the village and surrounded by countryside with one other property opposite and nearby. Three hundred acres of Forestry accessible to the public are half a mile away. We are ten miles from Cardiff, three miles from the historic town of Cowbridge, six miles from the nearest beach Llantwit Major and four miles from J34 of the M4 motorway. This makes the location an ideal touring base for South East Wales with its numerous tourist attractions. Spacious bathroom accessed from open plan kitchen/ lounge area : bath with overhead fixed shower. Wash hand basin. W.C. with transfer point alongside.Heated towel rail. All bed linen provided and changed weekly if stays are longer than 1 week . Additional pillows and blankets available in wardrobe. Free off road parking is available in the forecourt between the main house and bungalow. Secure locked storage is available for bicycles, golf clubs, fishing equipment etc. Hand Towels and Bath Sheets provided for two guests. Bath mat provided. Tea towels provided. All changed weekly if stays are longer than one week. Front door leads to open plan lounge area with three seater settee and armchair. Large flat screen television and DVD player. Stand with comprehensive selection of tourist information and maps. Fresh milk and tea/coffee etc provided on arrival for all bookings. Complimentary bottle of wine, choice red or wine for weekly bookings. Ample saucepans etc., utensils, crockery and cutlery are provided. The kitchen area has a table and four chairs. The rear door leads to the patio area with an additional wooden table with parasol and four further chairs. Mature rear garden with pond and natural stream with seating areas accessed via the patio area. Small courtyard garden to the front of the main house is accessed via the forecourt . NGS approved. Local beaches at Southerndown and Porthcawl are suitable for surfing. Secure storage provided for golf clubs etc. Nearest courses : Cottrell Park and Vale Resort : both have two eighteen hole courses and approximately four miles away. The bungalow is wheelchair accessible :both front and rear doors and internal doors. Rugs can be removed on request. Please note the bathroom does not have a walk-in shower. The area has such a diverse mixture of attractions and activities, you will be spoilt for choice, from city to historic towns, from coast to countryside, from historical sites to the modern iconic buildings of Cardiff Bay. At Y Bwthyn Bach your walk can begin immediately you step outside, choose either forestry paths or public footpaths crossing the surrounding fields.